La Posada De Los Farios, Chile | Tailwaters Fly Fishing Co.
Anglers first travel to Santiago, Chile (SCL) via direct overnight flight (9 hours from DFW) from one of several U.S. cities including Miami, Houston, New York, and Dallas/Ft. Worth. Travelers connect in Santiago onward to Balmaceda Airport in southern Chile with LATAM Airlines. Upon arrival into Balmaceda, guests are collected and driven to Coyhaique for lunch and onward 3.5 hours north to the lodge. La Posada offers private float trips on the Cisnes River, walk and wade days on smaller tributaries and creeks, classic Chilean laguna fishing, numerous stillwater fisheries, and opportunistic overnight trips down to the fjords for sea run rainbows and browns. Brown and rainbow trout are the predominant species, and dry fly fishing is the norm most often with hoppers and other terrestrials. The Chilean trout season runs December – April, and you can expect favorable fishing conditions anytime the lodge is open. (See WHEN TO GO below for more details). Is La Posada de los Farios Right For You? If you are a serious angler who prefers a quiet lodge setting with a more “homey” atmosphere and lots of private fishing opportunity, this is the destination for you. With a maximum of six guests, La Posada is for small groups that are interested in an intimate and quiet experience without any social pressure at the lodge – or pressure from other anglers on the water. 6 Nights / 5 Days Fishing is $3850 per person, based on double occupancy. Shorter and longer packages are available. Packages include all accommodations, meals, beverages, and guided fishing. Additional expenses include, but are not limited to, airfare to Balmaceda, fishing licenses, and gratuities. Note that groups of 4 or more receive a 10% discount. (See RATES for more details). La Posada de los Farios (“The Inn of the Brown Trout”) was founded in 1994 by American, Rex Bryngelson. Rex and his wife Maike run their charming lodge located on the banks of the Cisnes River. They offer the ideal trip for anglers interested in a more intimate and private angling / wilderness experience. With only three bedrooms, the family-run outfit offers what we believe to be the most personalized and intimate experience available in Chile. 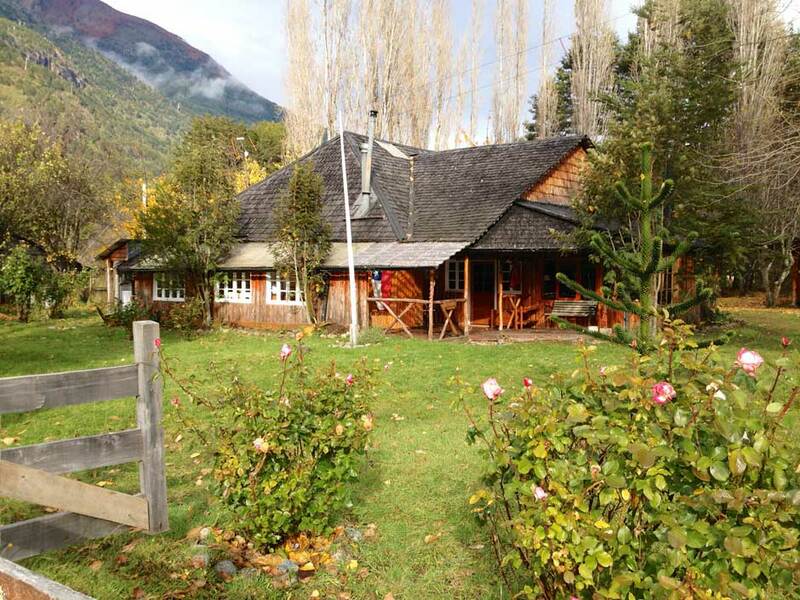 The Cisnes Valley and the other venues frequented at La Posada de los Farios are exclusive of competing operations (3.5 hours drive north of Coyhaique) and guarantee a peaceful escape with zero angling pressure from other lodges in the Aysén Region. This quiet, homey lodge offers a diverse weeklong program as well as shorter visits based upon availability. The typical week would include floating on the Cisnes, walk and wading on spring fed tributaries and hidden lagunas feeding the Cisnes, and spending a day or two fishing one or more private lakes for HUGE browns and rainbows. There are also trips down to the coastal fjords for trophy native and sea-run browns and rainbows as well as salmon when conditions are favorable. La Posada de Los Farios combines incredible fishing opportunity, stunning scenery and genuine hospitality . 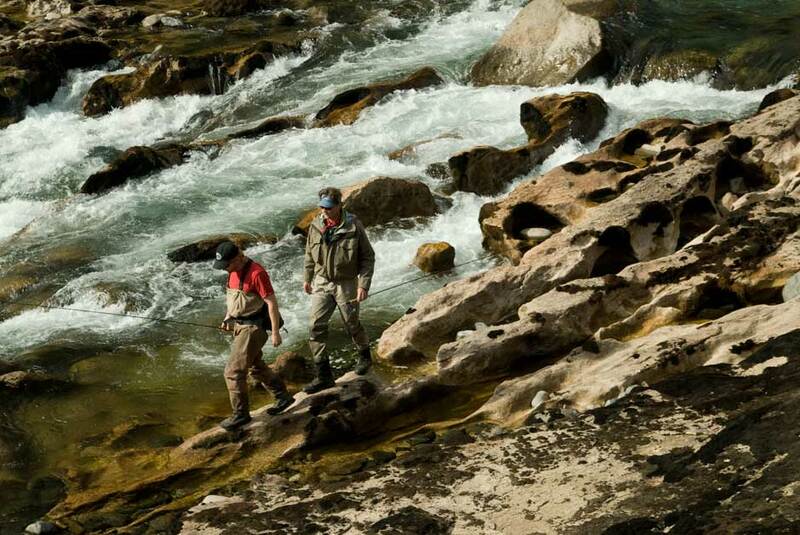 . . the complete Chilean trout fishing experience. La Posada de los Farios (“The Inn of the Brown Trout”) was founded in 1994 by American, Rex Bryngelson, and his lovely Chileno wife, Maike. Rex has been exploring, rafting, and pioneering today’s fishing program in Chilean Patagonia since 1988. Their small lodge on the banks of the Cisnes River in Patagonia is an extremely charming operation perfectly designed for groups interested in a more intimate and private angling and wilderness experience. With only three bedrooms, the family-run outfit offers what we believe to be the most personalized adventure available in Chile that is truly off of the beaten path. The Cisnes Valley and the other venues frequented at La Posada de los Farios are exclusive of competing operations and guarantee a peaceful escape with zero angling pressure from other lodges in the Aysén Region. The lodge is located north of Coyahique, Chile approximately 3.5 hours via ground transportation on an old working cattle ranch. This inland part of the Cisnes Valley is surrounded by the dramatic Andes Mountains, not too far from the Argentine border, and just to the south of the Queulat National Park. If you are a serious angler who prefers a quiet lodge setting with a more “homey” atmosphere and lots of private fishing opportunity, this is the destination for you. The sixty year old lodge is built on the banks of the lower Cisnes (Swan River), one the most scenic and idyllic settings you can imagine. The fishing schedule is of course completely up to guests, however the typical program is based around floating a few days on the Cisnes, walk and wading a few days on spring fed tributaries and hidden lagunas feeding the Cisnes, and spending a day or two fishing one of or more private lakes for HUGE browns and rainbows. The Cisnes Valley running through the ranch is incredibly diverse, and offers a myriad of differing fishing style and character. We also highly recommend taking a day in the middle or tag end of the week to head down into the Queulat & Magdalena National Parks to try your hand at fishing some of the coastal fjords. Depending on the conditions, a two day / one night trip can yield some of the best fishing for enormous browns, salmon (kings, silvers, atlantics), and sea-run rainbows. The traditional five-mile float on the Cisnes is absolutely gorgeous. Likened to the Madison, the shallow, riffley, wide river offers classic dry fly fishing with large terrestrials such as hoppers, beetles, ants, ect. The fish are not particularly large on this stretch, with the average brown measuring up around 16-17 inches, however it is very user friendly and high-volume fishing well suited for experienced and inexperienced anglers alike. The floats are done in inflatable rafts with comfortable frames / chairs, and there are numerous spots anglers can get out to walk and wade. Feeder streams, lowland lagunas, and spring fed tributaries in the area offer very peaceful and exclusively walk and wade opportunities as well. You can hop across some of these creeks, however they are home to some huge browns that will readily eat a properly presented dry or nymph. Anglers will usually spend at least a couple of days experiencing this style of fishing for larger trout with Rex and his crew of Chilean and American guides. All of Rex’s guides return every season, are bilingual, and are extremely knowledgeable of the area and the fishery. 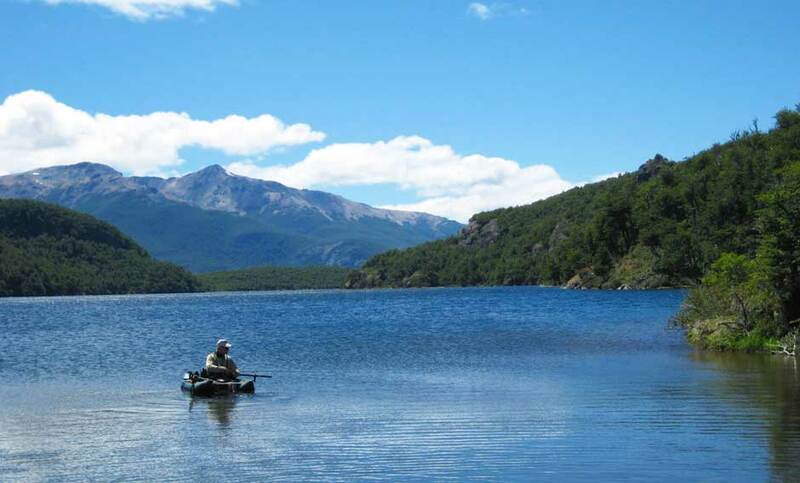 The lake fishing with La Posada de los Farios is certainly not to be overlooked or dismissed. Anglers and guides ride via horseback into with the ranch’s own private lake or to the nearby Lago Torres. After riding into either lake, anglers depart in hard bottom boats in search of surface feeding trout. The average sized fish is a true 17-22 inches caught on large surface attractor patterns. However, there are MONSTER fish caught every season on the lakes; especially if you are willing to throw streamers. The lake fishing is a cool experience that all guests should partake in. The 1.5 hour horseback ride through fantastic old growth beech tree forests and the consistency of highly visual dry fly fishing is well worth the trip. Depending upon the conditions, a trip down to the coastal fjord rivers is a unique option for the most intrepid guests . . . it is worth the drive for the scenery alone. The easy drive to one of the nearby national parks is stunningly beautiful, and the coastal fjords of Chile can offer some of the best BIG fish opportunity found anywhere. Although this program is impractical all season because the conditions need to be just right, the lodge can communicate with radio to caretakers in the area to determine river conditions and clarity. Assuming everything is right, anglers and non-angler alike travel down to the Fjords and plan on spending one night and up to two days fishing for chiefly sea-run rainbows that average a solid 5-10 pounds (with some much larger). There are also regular chances for big browns, kings, silvers, and Atlantic salmon, not the mention the indigenous robalo . . . a voracious, shallow running, crab eating species that is also wonderful in the frying pan! Starts roughly 1 hour upriver to the east of the lodge. This is a 10-mile float and can make for a very long day. However, it can be broken up into 2 parts if anglers are willing to make an approximate 1 mile hike out from the river to the road at the 1⁄2 way point. It is a moderately difficult hike along a dirt road with a short but steep uphill accent of approx. 300 yards. This float section is the highlight of our fishing program both fishing wise and scenically. It flows through semiarid mountainous terrain and can offer excellent dry fly action with the right conditions. There is one class III rapid to be navigated about 3⁄4 of the way through the float. We typically fish large attractor dries like Chernobyls, Fat Alberts, Gypsy Kings and Hoppers. However, streamer fishing can be very productive as well, especially with wet high water conditions. Wooly Buggers with white rubber legs typically work the best. Fish on this section average between 15-18 inches and anglers often have shots at fish 20 inches or better. We sometimes make stops to fish one of the several spring fed lagunas or small spring creeks that are accessible along the river where larger trout can be found and often sight-fished to. From the take out it is about a 40-minute drive back to the lodge. An overnight float option is also available – super unique and exciting! This float starts right from the lodge and is about 6 miles long. This is a good place to start the week after the long trip down to Chile. This section is wide and meandering and floats through some old growth Coihue (coy-way) forest that makes up the transition zone between the drier Patagonian steppe and the coastal temperate rain forest. Fish average 10-14 inches on this section of the river and are very abundant. This is not to say that larger fish cannot be found here! All of the very largest predatory browns (25 inches +) we have caught from the lodge have been on this section of the river. The river passes by 2 small tributaries, The Rio Las Torres and the Rio Rodriguez, and anglers may stop to fish the lower sections of either one of these, as well. We typically fish large attractor dries like Chernobyls, Fat Alberts and Gypsy Kings. Black-bottomed foam flies seem to be the most productive – we believe this is because fish are always on the lookout for beetles that are especially abundant in this area. Every two years we experience a prolific hatch of the huge Cantaria beetles (large stag beetles) from mid December through February. Streamer fishing can also be very productive, especially with high water conditions. Wooly buggers with white rubber legs perform very well. From the take-out it is only about a 15-minute drive back to the lodge. This float can also be done in 2 parts. We often offer the upper 1⁄2 of this float as an option on a guest’s day of arrival. This float is relatively new, having recently been opened up as a result of the expansion of the “Carretera Austral” or “Southern Highway.” The float begins about 25 kilometers down river to the west of the lodge (30 minutes). Here the river delves into the lush coastal rainforest with even more rugged and spectacular glaciated mountain terrain providing for the back drop. Along the way to the put-in we pass by Villa Amengual, a quaint rural village of about 200 inhabitants and our closest link to civilization. The river gets big down here and flows several miles away from the road and, due to the fact that there is a tricky class IV rapid to be negotiated, we will only undertake this float when the water flow conditions are favorable. We choose not to chance making this float when the water conditions are too high and, for safety reasons, we will only operate this float as a two boat trip. We cannot guarantee it will be an option for everyone during their stay, but it is typically possible most of the season. It is hard to imagine a more spectacular float in Chile, or anywhere else in the world for that matter. The river is big, the mountains are big, the forest is lush and primeval and, although the typical brown is not overly large, we have seen some truly monster browns come out of the depths on nearly every trip we have made down there, especially in the tight canyon sections along the rock walls. We believe it is only a matter of time before someone lands a 30+ inch fish down there. It is challenging fishing, often throwing large flies on heavy sinking lines, but there is the very real possibility of catching, or at least getting a glimpse of, that brown trout of a lifetime. Due to the paving of the Carretera Austral (Southern Highway) we have also added the Rio Manihuales to our float fishing options. 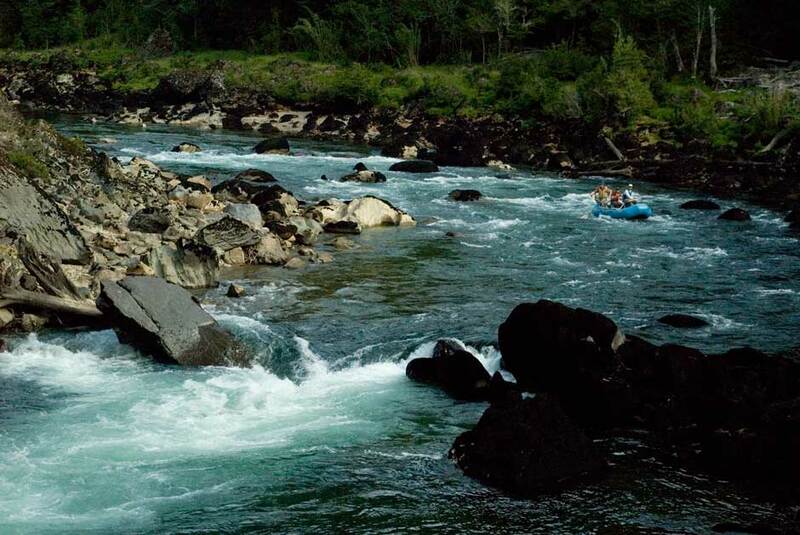 There are 3 or 4 floatable sections of this river from about 45 minutes to 1 hour and 15 minutes away from the lodge. This will be our closest and only option (aside from the coast) where we can fish for rainbow trout in addition to brown trout. The Manihuales is a large river and best fished from a boat. The river is rugged with immense logs lining the banks in several areas providing for excellent structure for larger fish. Deep pools with high rock walls on other sections also provide great habitat for large fish. The terrain surrounding the Manihuales is very similar to the middle Cisnes area near the lodge and highlighted by spectacular views of Cerro Picacho, an impressive peak reminiscent of the Matterhorn. The browns and rainbows of the Manihuales average good size and it is almost a given that someone during the day will land a fish in excess of 20 inches during a day float. There is some moderately easy wading to do right in front of the lodge that becomes easier the lower the water gets. During high water we will suggest floating instead. This is a good option on the day of arrival. About 10 minutes up from the lodge there is a gorgeous wading option at a place we call Jose’s. This is moderately difficult wading and involves and fair amount of walking. The river bottom is primarily large cobbles and boulders, but not slippery, nor is the current overly fast. This section of the river is very rarely fished. It is quite scenic here where the river leaves the rugged canyon section of the river called La Garganta (“The Throat”). A few seasons ago, some of our guests spotted an endangered Huemul deer here at close range. The average fish tends to be small (10-14 inches) but they are abundant and we often do very well here fishing smaller dries. Especially productive are small (#14) black beetles, but larger attractor dries also can work well. We typically bring a raft with us to cross the river and to fish a large pool that is inaccessible wading and where we have the best luck for larger fish. There are also a couple of hidden and protected oxbow lagunas here that can produce some good size trout, and are a nice respite during windy days. Another wading area just upriver is the “New Zealand Hole,” named as such because it is a deep canyon pool that evokes a classic NZ trout fishing setting. It involves a 1⁄4 mile walk down a moderately rugged trail to reach. This is where the lodge record brown (31 inches) was caught in 2005 during high water conditions; a 28 inch fish was also caught here the same day, both using streamers. It is a gorgeous place to fish with steep granite walls surrounding a deep bottomless pool. This is a good place to spot large browns that are very difficult to trick into eating a fly. However, it is rugged and only recommended for agile anglers who are able to scramble over steep rock along the river’s edge to get into position to present a fly. There is some relatively easy wading where the pool tails out. Dry fly action can be very good here but, as is typical with many of the deep pools along the Cisnes, the fish can be very spooky and some very accurate casting is often required to be successful here. 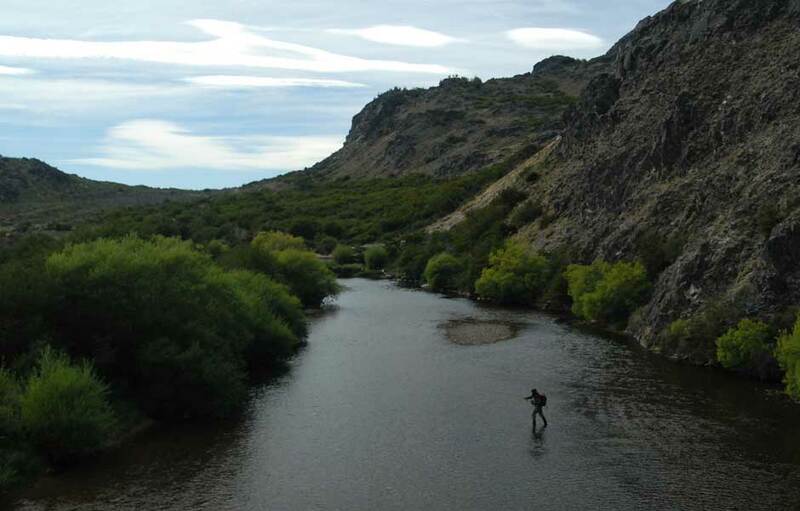 There are 2 small tributaries, the Rio Las Torres and the Rio Rodriguez, located about 10 minutes downstream from the lodge that can be fun to fish. They are both reasonably easy wading. Getting to the Rio Las Torres involves using a raft to cross, or crossing using a small cable car that traverses about 20 feet above the water. Both rivers produce primarily small browns, but we have seen 20+ inch fish come out of both of them over the years. We believe these larger fish are spawners that decided to stay in the tributary to prey on the smaller fish. The tributaries can be good options during windy days as they are relatively protected. We access another tributary called the Canelo River about 10 minutes up from the lodge that can also be a lot of fun but, the wading can be moderately difficult as it is very rocky. All of these tributaries are only good for a few hours each so we will sometimes move from one to the next to make a full day out of it. The Moro River is another productive tributary that comes into the Cisnes about 40 minutes up-river from the lodge. It has a very scenic canyon with nice pools and is relatively arid and protected. 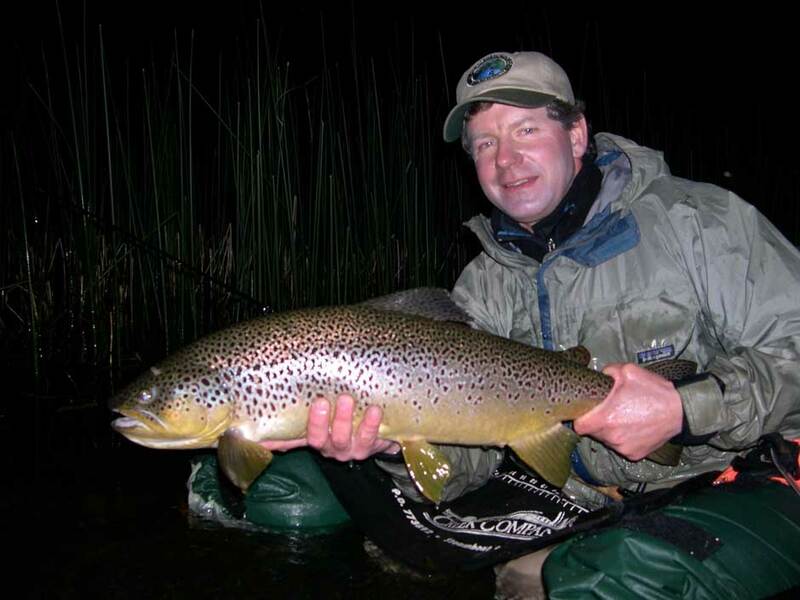 Dry fly action can be very good and we often find larger browns in each of the main pools. It is tough wading and only recommended for the anglers who are strong waders and hikers and up for a good strenuous adventure. Larger average fish (14-18 inches) on this section. About 1 hour upriver from the lodge the Cisnes splits and the southern branch becomes a small and very easily waded river that could probably best be described as a creek. This is where the mountains begin to fade giving way to the vast open Pampa to the east. Conditions tend to be windier here because of the relative lack of protection. This section can make for excellent dry fly fishing especially, during the hopper season (mid-January through mid-March) and then afterwards as the mayfly action gets going, from mid-March on. There are 2 main beats we wade fish on this section. There are also several small spring-fed lagunas that are accessible in this area that can produce some larger trout. Fishing these section can involve a good amount of walking (1-2 miles) over flat easy terrain. About 50 minutes upriver. This is also relatively easy wading with small gravel, but bigger water than the upper Upper section (during high water times we typically opt to float fish rather than wade this area). Again, dry fly action can be excellent during the hopper season (mid-January through mid-March) and then afterwards as the mayfly action gets going, from mid-March on. There are 3 main beats we fish here, all of which provide access to some of the spring fed lagunas or small spring creeks that can provide for good dry fly action for larger fish. Sight fishing is often possible in these lagunas. Again, a fair amount of walking (1-2 miles) over easy terrain is required to best take advantage of the fishing options in this area. River crossing can be difficult, especially during higher water conditions. Located about 20 minutes from the lodge and surrounded by jagged mountain peaks that literally rise up over 1 mile above the lake’s edge. It is hard to imagine a more scenic setting. The lake is surrounded by a lush and ancient old growth temperate rainforest and completely protected within the 40,000-acre Lago Las Torres National Reserve. There is a very healthy population of brown trout that average 18-22 inches and are spectacularly colored due to the rich organic quality of the water. Dry fly action can be superb on warm days as the browns aggressively hunt adult dragonflies cruising just above the water’s surface. It is common to see large fish launch completely out of the water to capture dragonflies several feet above the water. They will often exhibit the same aggressiveness towards a large attractor dry fly, such as a Gypsy King, when effectively presented. The explosiveness of the takes can be unforgettable. There is a tremendous amount of structure along the edges of the lake with numerous large logs, weed beds and reed areas. There are several shallow open areas between the reeds and the shoreline where large browns can sometimes be stalked and sight-fished to. There is a remote and very productive hidden laguna (where we keep an Outcast boat) that is connected to the main lake via a small creek. It involves a moderately difficult 1⁄4 mile trek through the jungle to reach it. The fishing in the laguna can be excellent for fish averaging 18 inches and better. It is very protected and a good place to be during windy conditions. For many people, the thought of lake fishing conjures up images of vast, featureless expanses of water and hours of mind-numbing trolling, hoping for some unseen denizen of the deep to somehow find their lure and bite. The lake and laguna fishing at Rex’s couldn’t be further from this kind of picture. Imagine instead small, manageable-sized lakes and ponds, the kind you can often float tube around in an hour or less. Visualize shallow, clear water, where you can see many of the beautifully marked 12 – 20 inch browns before you cast to them. Consider that these fish see only a handful of anglers each year, and often rise eagerly and aggressively to large dry flies, as well as chasing midsized streamers and nymphs. In addition, some of the lagunas are tiny; the kind you sneak up to, not really believing anything bigger than a guppy could possibly live in, then stand slack-jawed as a big brown head engulfs your hopper off the surface, and who upon hook set proceeds to cartwheel wildly across the top of the water. No, trolling this DEFINITELY is not! It’s a great trip for those who enjoy riding horses. Our horses are very mellow. It’s a relatively easy 1.5 hour ride (4 miles) beginning in arid open country on the upper river where the mountains just start to begin to settle down before melding into the open Patagonian pampas to the east. The trail rises up several hundred feet through this spectacular open mountain country before eventually leading into an old growth Lenga forest (Southern Beech) that surrounds the entire lake. Lago Los Farios itself is a mile and a half in length and truly pristine with fantastically clear water. One of our guests and guides last year had the rare experience of sighting an endangered Huemul (Andean Deer) close up as it waded along the lake’s edge. 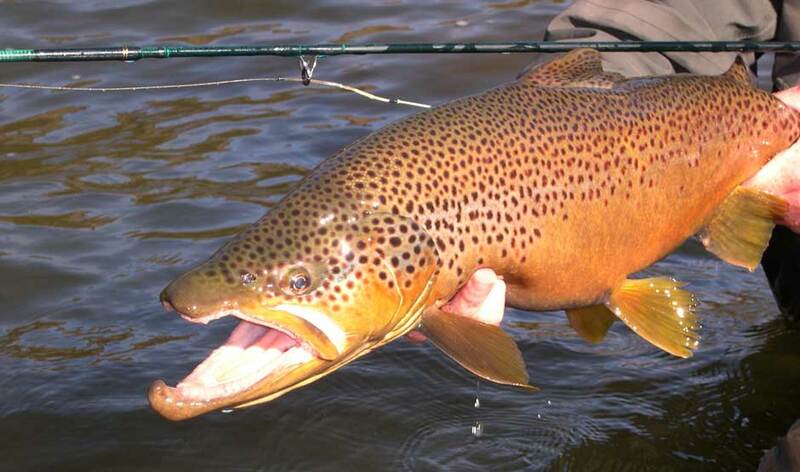 There is a very large and healthy population of brown trout that averaging between 15 – 19 inches that are incredibly stout and hard fighting. We believe that a prolific scud population contributes to their exceptional condition. Dragonflies are abundant and we often have great success taking fish on large drys (Gypsy Kings, Chernobyl Ants, etc.) throughout the season. As always, weather conditions dictate the techniques that we employ to take fish, with warm days typically providing the best surface action. Our standard coastal fishing option involves a 1.5 to 2 hour drive north to the Queulat National Park. It is a tremendously beautiful drive and worth the visit just for the scenery alone. We recommend it as an overnight and typically use the quaint Cabanas Queulat as a place to overnight, but the luxurious Termas de Puyuhuapi is also an option. This is a 4 mile float on the river that ends right at the Cabanas. It is very scenic as it flows through the lush rain forest. Several waterfalls are seen along the way. The water is incredibly clear. The river has many small resident fish (browns and rainbows), but our primary goal is to find the large sea-run fish that make their way into the river. Sea-run Rainbows and Coho Salmon are commonly found and Atlantics are also possible, but the highlight is having a run-in with one of the elusive copper-colored sea-run browns that hide among the logjams along the river’s edge. This is technical fishing as there are a great deal of logs in the river. Anglers should be prepared to lose several flies throughout the day. We can also wade fish the lower reaches of the Queulat River walking out from the Cabanas. There are 2 very good pools about 1⁄4 and a 1⁄2 miles upriver, respectively, and this is where we most commonly find large sea-run fish in this river. Wade fishing this area involves a fair amount of walking. There is also a nice wadeable run between these two pools that can also be productive. In addition, at low tide, there is good fishing at the mouth of the Queulat. The mouth area can be very good for sight fishing when conditions are sunny and calm as there is a substantial shallow flat on which to wade and stalk fish. Located about 20 minutes from the cabins. It is a larger braided glacial river that requires a 1⁄2 mile walk from the vehicle to get to the lower pools. The water is typically colored from glacial silt and the best fishing tends to be early and late in the season when there is less glacial melt water coming into the river. We wade fish the lower 1 mile or so of this river where it is not uncommon to find large sea-run rainbows and Cohos attracted into the cold oxygen-rich waters. It is also common at the mouth of the river to catch the native Robalo, which are abundant in the brackish waters in search of small crabs. They are aggressive towards flies stripped slowly along the bottom. Robalo are excellent eating and we often bring them back to the Cabanas for a delicious appetizer. This is a small glacial-fed river and we typically only fish the very bottom section of it where it dumps into the Puyuhuapi fjord. As with all of the river bocas flowing into the salt, it is best to fish this on or around low tide as there is more fishable water and more space to move around. Rainbow trout and Cohos are the most common sea-run fish to be encountered here. This is an old glacial moraine that is forms a point at the opening of the Queulat fjord where it joins the Puyuhapi fjord. It is a spectacular fishing location that trout, salmon and native Robalo are attracted to because of the tidal currents continually wash back and forth across it. It is common to see Toninas (Pacific white-sided porpoise) while fishing here as well as Pelicans and the beautiful Black Necked Swan. However, this area is exposed and weather conditions need to be calm in order for us to fish here. This area can be very good for sight-fishing when conditions are sunny and calm as there is a substantial shallow flats area to wade and stalk fish. A note on the coastal fishing: conditions and fishing success are highly variable on the coast and anglers should be aware that we make no promises about experiencing great fishing out there. However, we can guarantee great scenery and a unique experience. This is also a great place to take non-fishing spouses as there is a tremendous amount of sightseeing to do here. The highlight is the spectacular Hanging Glacier for which the park is famous for, and its surrounding trails, as well as a visit to the quaint port of Puyuhuapi that was founded by young German immigrants in the late 30’s and where you can tour the rug factory they built that is still in operation. Note about equipment for coast fishing: We recommend 7 or 8 weight rods for the coast with both floating and fast sink-tip lines, 0X or 1X 9ft leaders for floating lines and shorter leaders for sink-tip lines. The quaint, 60-year old building used by La Posada de los Farios in an incredibly stylish “old-school” Patagonian ranch house. It is not the Ritz, however fits perfectly in the spirit of the personable atmosphere that makes La Posada de los Farios an intimate, family-run operation. Each of the three bedrooms is equipped with a private bath, varying bed configurations, and plenty of storage for gear and luggage. 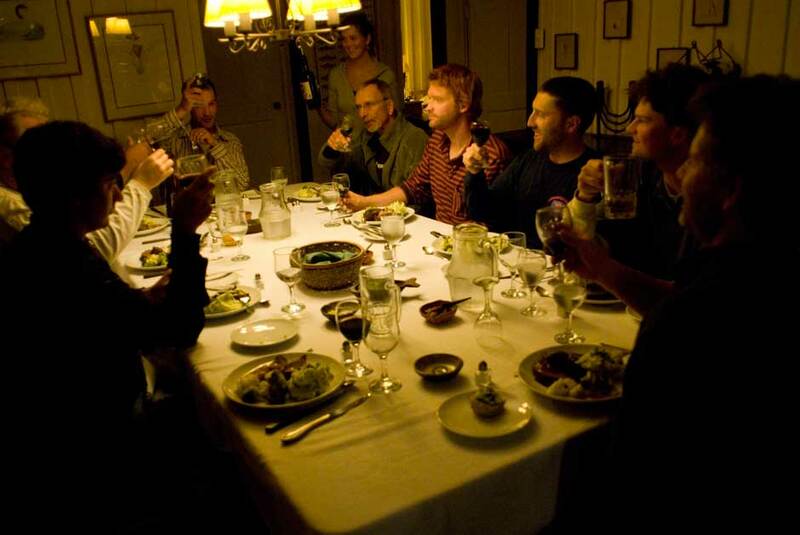 The delicious meals at the lodge are served family-style and of course include numerous fine Chilean wines. A farewell “asado” or Patagonian outdoor barbeque is prepared at the end of the week by local gauchos, and a wood-fired hot tub is a wonderful spot to relax after a long day on the water. The setting at the lodge in the Cisnes Valley is jaw-dropping beautiful, and we really cannot envision a more pleasant atmosphere with stunning scenery for a relaxing Patagonian trout trip. Only six angling guests per week (additional non-anglers can be accommodated). Anglers first travel to Santiago, Chile (SCL) via direct overnight flight (9 hours from DFW) from several U.S. cities including Miami, Houston, New York, and Dallas/Ft. Worth. After an early morning arrival the next day, travelers connect on to Balmaceda Airport in southern Chile with LATAM Airlines on a three-hour flight with one brief stop in Puerto Montt en route. 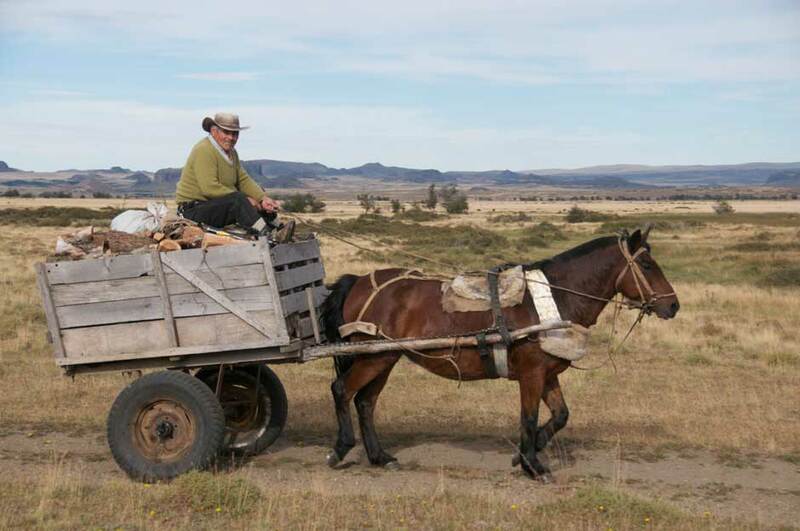 Upon arrival into Balmaceda, guests are collected and driven to Coyhaique for lunch and onward 3.5 hours to the lodge. Air charters can also be arranged from Balmaceda to an airstrip closer to the lodge. Many guests prefer to overnight in Santiago on the way down to relax after the long plane ride and see the city. Another option is to push southward to the town of Puerto Montt halfway between Santiago and Balmaceda. The nearby port town of Puerto Varas is a very pleasant and affordable venue to get over jet-lag and hang out before making the 1 hour flight onward to Balmaceda the next morning. Please ask us for details if you are interested. La Posada de los Farios is not exclusive to one week itineraries and will host guests on trips as brief as 3 nights and 2 days, contingent upon availability. However, we strongly encourage anglers to spend a minimum of 6 nights / 5 days of fishing with Rex in order to realize the complete experience. The 7 night / 6 day package is preferred. Afternoon (red-eye) departure from the United States to Santiago Chile. Arrival into Santiago the next morning. Upon arrival into Santiago, guests commute via an early flight from Santiago on to Balmaceda, Chile with LATAM Airlines. 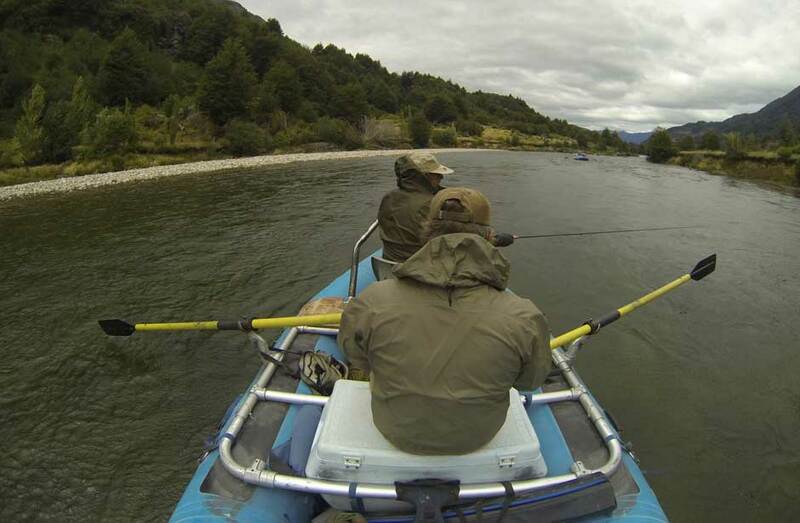 From Balmaceda, anglers are met and driven approximately three and one half hours to the lodge. Fishing Days! Each day is customizable and the daily schedule varies depending on where you will fish. Following a leisurely morning hanging around the lodge, guests are returned to Balmaceda in order to catch the afternoon flight to Santiago in time for the late evening connection on to the United States. Travelers arrive home early the following morning. Spring in Chile begins in December. Trees have dropped their blossoms and warm summer weather lands in Patagonia even before all the Christmas presents have been opened. Trout season in Chilean Patagonia swings into high gear by the New Year, and continues until leaves turn crimson and drop with the arrival of winter, in late April. 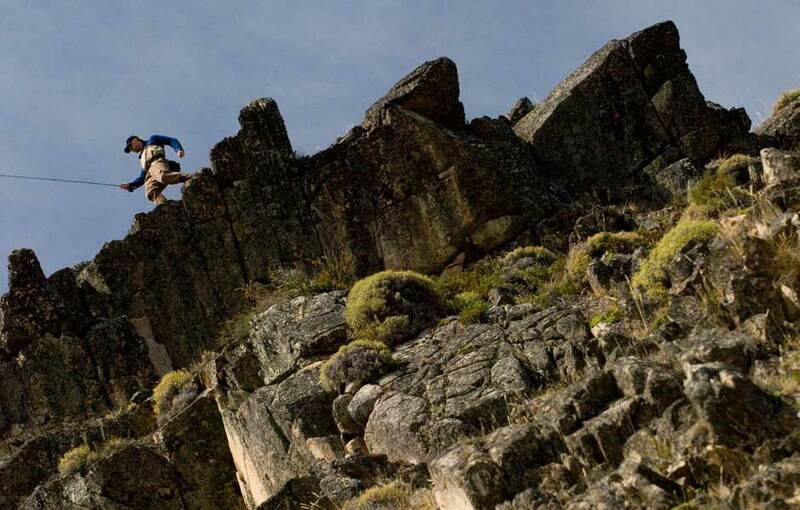 The summers of Patagonia are abbreviated, much like those of Montana and Wyoming. Warm days often begin with cool mornings and can be punctuated by sudden thunderstorms. But for the most part, the weather in this fantastic part of the world is consistently good from mid-December through early April. Their January is our June/July. Spring snow melt is gone, the temperatures are pleasant and reliable, and the hatches are predictable. Mosquitoes aren’t a concern in most of Patagonia, but the Lake District of Chile can be plagued for a few weeks with Chulihuachos, a pest resembling a horsefly that has all but disappeared by the end of the month. By the first of February trout begin to key on the caddis hatches and hoppers, stag beetles and other terrestrials that dominate mid-summer fly fishing action. Probably because of the weather, February and March are the most popular months to travel to and fish Patagonia. Too, our winter is a great time to escape to Patagonia’s summer and trout fish for a week or so; something difficult to do when the Rockies are frozen solid. The country of Chile is divided into 15 regions, with the vast majority of fly fishing taking place in the XI Region, called Aysén, that stretches from Puerto Montt to O’Higgins. Within this vast region of more than 109,000 square kilometers, fly fishing outfitters base out of the communities Lago Verde, Coyhaique, Aysén, and Cisnes. Weather in this part of the world is a complex mixture of heavy maritime climate with cold water influences from the Pacific to an increasingly dry continental climate as you head east toward the Andes and Argentine border. There are four different recognized climates with the Aysén Region: cold rainy temperate, Andean degenerating to steppe, cold steppe, and high altitude icy. 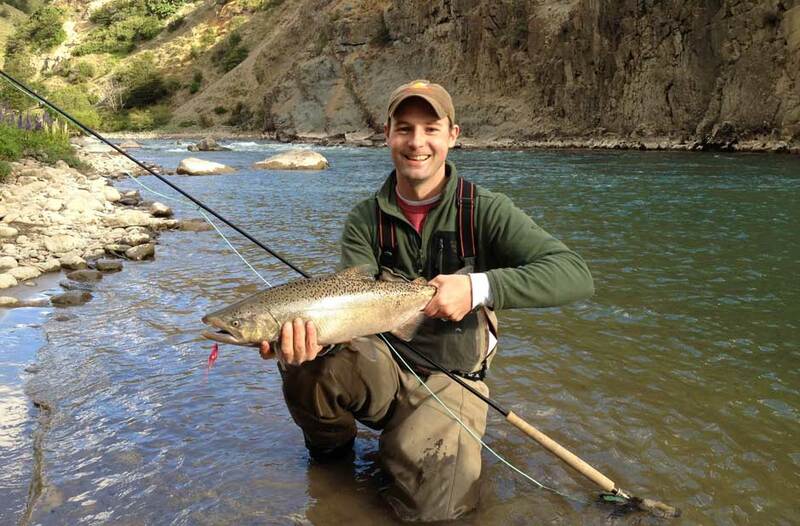 Trout fishing is the predominant activity at La Posada de los Farios. However, the scenery and atmosphere at the posada is extremely welcoming to non-angling companions who want to tag along. We encourage non-anglers to join anglers on a float trip down the Cisnes, take a horseback ride into one of the lakes, or join Rex on a visit to one of the neighboring subsistence farms for some local cultural interaction. The coastal trip is also offered and can be done as a day trip or combined with some fishing for the non-angling companion as well. There are some excellent trails to hike within the National Park, the most popular being a short trail to the Hanging Glacier overlook. Condors, parrots, kingfishers, ibis and woodpeckers, to name a few. A visit to some of the neighboring farms & villages is a fascinating day trip. It is often the most memorable part of a guest’s trip to Chile. The local rural people live a lifestyle reminiscent of what life in the Western U.S. must have been like a century ago. There are some wonderful hiking opportunities into some very remote and fantastically beautiful country at La Posada de los Farios. Guests interested in hiking should bring appropriate footwear, rain gear (top and bottom) and day-pack. The fjords of Coastal Chile offer non anglers and anglers alike some of the most spectcular and dramtic scenery in all South America. If you are booked for a week at La Posada, we highly recommend taking the two and a half hour drive to the coast (an amazing trip in itself) and spending at least one night and a day or better exploring this maritime eco-system. There are many spectacular sections of the Rio Cisnes to raft. Most parts of the rivers are easy w/little dangerous whitewater. However, challenging whitewater trips can be arranged for the adventurous visitor. The area around LPDLF is horse country and numerous trails lead off in all directions through spectacular mountain vistas and virgin forest. Horses are well-mannered and sure-footed. *Groups of 4 or more receive a 10% discount. Guests who opt to explore the coastal fjords fishing have the option of returning to La Posada de los Farios each evening, for which there is no additional cost, or the recommended option of staying overnight on the coast at the cabins in Queulat National Park or in a local hosteria near to the coastal fishing destinations. Anglers who choose to overnight on the coast will incur a $150 per night/per person charge, to cover lodging and meals. The charge will be paid directly at the lodge. Again, staying overnight on the coast is strictly optional but highly recommended. Round-trip airfare to/from Balmaceda, Chile; Use of fishing equipment and flies; Fishing Licenses ($75); Gratuities; Hard Liquor other than Pisco; Items of personal nature including telephone calls; Laundry service; $140 Chilean Entry Fee; Airport departure taxes; Meals, Hotels, Ground Transportation and other travel expenses before and after the fishing portion of the trip in Puerto Montt or Santiago; Air charters to/from the lodge when applicable. Tailwaters Travel must adhere to the cancellation policies of the guides and lodges which it represents. La Posada de Los Farios’ policy follows: A fifty percent deposit is due at the time of booking to secure your reservations with LPDLF. The remaining balance is due 60 days from arrival. Cancellations made more than 60 days prior to your trip date will incur a 50% cancellation fee or, your reservation can be rolled over to the following season. Cancellations made 30-60 days prior to your trip date will incur a 75% cancellation fee. Cancellations made less than 30 days prior to your trip date will incur a 100% cancellation fee. Refunds or credits cannot be issued for fishing time lost due to inclement weather. Refunds of deposits/payments made on credit cards will be charged a 3.5% service charge to fully compensate Tailwaters Travel for all bank charges incurred. Receipt of deposit and/or final payment is acknowledgement that registrant has read and accepts the cancellation, refund and responsibility clauses.